Cavies, more commonly known as guinea pigs, make an excellent small pet due to his lovable gentle nature. They are generally a low maintenance pet and when fully grown are 20-26cm long, 10 cm tall and weigh from 0.5-1.5 kgs. Being small they are easy to keep in a small backyard and are preferably kept in a secure hutch to protect them from predators. His short body and limbs are not designed for climbing or jumping and a distinctive feature of the cavy is that he has no tail. A well looked after healthy cavy can live for up to 7 years. 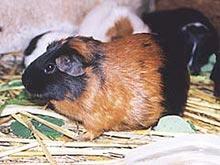 Abyssinian : Has a harsh wirey coat and the hair swirls like cowlicks over the body of the cavy. American or English : Has a shorthaired smooth coat. Peruvian : The coat is silky, straight and long. The coat is parted down the spine and can grow very long with care. The maintenance of the Peruvian is higher and he should be brushed daily and washed regularly to keep him in good condition. Agouti : This is named after a South American rodent. The Agouti can be golden, silver and cinnamon. In all of them the tip and the base of each hair is black, with the defined colour being the middle bar. Self : Is a solid colour coat and they come in a range of colours which include black, white, chocolate, cream, golden, beige, red, blue and lilac. Dutch : The cheeks, ears and hindquarter are a basic or self colour. There is an underlying background of white that forms a band around the middle and they have a wedged strip "blaze" down the front of their face. Himalayan : The coat is pure white and the nose, feet and ears are marked with colour or "points". The points can vary from pale buff to dark brown or black. Tortoiseshell and White : The coat is a patchwork of black, red and white. A well marked tortoiseshell and white should have between six and ten black, red and white square patches. Guinea pigs are vegetarians and will eat fruits, vegetables and most grasses. He is known to survive on just grasses however it is recommended to provide a balanced diet in order to maintain maximum health. 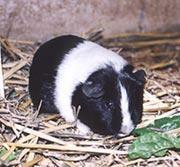 There are guinea pig pellets available at commercial outlets that are vitamin rich. These combined with a variety of green food, fruits and vegetables, hay and a fresh supply of clean water each day should ensure a healthy pet. Guinea pigs are sexually mature from 2 months old. The female comes into season every 16 to 19 days so males and females should be separated to avoid unwanted pregnancies. The gestation period is 10 weeks and the young are born fully haired with their eyes open. The female comes into post-partum heat as soon as she delivers the babies so if the male is running with her when she delivers she may fall pregnant immediately after birthing. The cavy as a rule is a healthy animal. Problems usually arise from bad feeding and care. Hair loss can result from incorrect diet. Scurvy can arise from a Vitamin C deficiency so remember to include lots of rich greens in their diet. If your guinea pig appears listless or shows any signs of illness including soft droppings, bloat or lack of appetite please consult your veterinarian. In summary the Cavy is a great pet for all of the family to enjoy including children. They are not overly demanding and can become as affectionate as a pet dog or cat. There are also numerous cavy clubs and rescue organisation around Australia who can be contacted for more information. Please refer to the clubs directory or the animal rescue section.